I’m going back and rereading while making notes because I loved and still love these books; my hope is that I’ll start to notice some patterns as I move through the books and that I’ll be able to talk about pulp tropes, gender assumptions, reading fiction aimed at a gender other than your own, and writerly techniques in an entertaining and (maybe) useful way. I’ll go consecutively by issue date of the ones I have; I will go back and fill in earlier ones as I run across the books. I don’t envision doing a post of this kind more than once a week; this one turned out close to six thousand words. Some facts about the books. The stories in Doc Savage Magazine, which ran from 1933 to 1949, were written by Lester Dent under the pen name Kenneth Robeson. Dent, who had a specific formula for the books, was paid $500 per novel, which later increased to $750. $500 dollars in 1933 had the same buying power as about $9k current dollars. After Dent’s death, his literary agent Will Murray sold the books to Bantam and someone made a lot of money off that series. The earliest book of the bunch that I have, Quest of Qui, was originally printed in 1935 in Doc Savage Magazine and reprinted by Bantam in 1966. It’s marked as number 12 in the series. The cover does reflect the story but not any actual scene that occurs: Doc, clad in natty Arctic winter wear, kneels in an ice cave, clutching a spear, while a dragonboat’s worth of Vikings approach. There was no wind, and the authorities later decided this accounted for what occurred, for had there been a wind, many things would doubtlessly have been different. Had there been a wind, a baffling mystery might never have come to the notice of the world, and to the attention of Doc Savage. A number of men might have gone on living. And a scheme of consummate horror would probably have been executed with success. But neither the Sea Scream nor her wealthy owner not her guests were of special importance to the world that day, as far as news was concerned. Finally, after enough not-important, yes-important, no-not-really-important back and forth to get whiplash, things start happening. Or sort of happening: they spot a vessel odd enough to elicit this unlikely nautical expression from the helmsman, “I hope to swab a deck!” We find out a number of guests are aboard, “one a lady.” What this woman is doing out at sea with a gang of men is anyone’s guess, but I remember Doc Savage’s world as being oddly innocent at times and this material was aimed at young boys, so we’ll presume everyone’s just enjoying the nice ocean breeze. “A Viking Dragon ship,” replied the woman. and then a scene break occurs followed by us still being in exactly the same moment. The men laughed, for the idea was, of course, a little preposterous, Viking dragon ships having gone out of style shortly after the days of Eric the Read and other noted Norsemen. After thinking about it much longer than I should have needed to, I realized these are actually relics from being serialized in a magazine, which is interesting, because you can tell Dent always wanted to end a section with a bang. That mystery solved, I could move on, eying the gender stuff in the passage warily and yet refraining from comment for now. A crewman is killed by a spear that is “ponderously cast.” “Ponderously” is not an adjective I would normally think to use in describing the action of a spear. Maybe it’s a very big spear. At any rate, this man, whose leg has just been impaled by the aforementioned spear, “upset on the deck and lay there making faces.” The faces are not described; the ones that sprang to my mind were probably not what Robeson intended. A lot of action occurs, most of it told in passive voice with an insistence that reminds one the writer was being paid by the word. A girl glimmers offstage briefly, described by the men as beautiful and the lady as “homely as sin,” which leads us to believe she must be beautiful indeed. I do feel compelled to point out that the narrative “women hate any other women prettier than themselves” is not really my experience and certainly does effectively hamper women trying to work with each other. Damn your hegemonic urges, Lester Dent! The men are leading the girl around by a thong around her ankle, which seems to me like a method prone to a lot of tripping. Various things happen, and the guests end up on the dragonboat while the Vikings drive off in the power boat, which sounds like a scenario out of a Geico commercial. Once the sailors, guests, and lady manage to get ashore, Johnny, one of Doc Savage’s men, becomes involved. Here’s the precís of him delivered earlier: William Harper Littlejohn, the bespectacled scientist who was the world’s greatest expert on geology and archaeology. (Between them, Doc and his men cover every possible field of knowledge.) He pronounces the dragonboat authentic, using the patented Johnny “I only use big words” schtick and its origin the fleet of Tarnjen, “one certain ancient Viking freebooter.” Googling on Tarnjen would suggest the name was plucked at random from the ether. Had he known exactly how much trouble he was going to have, the knowledge might conceivably have turned his hair white. “Might conceivably,” it should be noted, is already being applied to an entirely hypothetical situation. Over the next few chunks Johnny finds the dying man, hears clues, and then has to hide when a plane appears and strafes him. He hides; the plane lands and a prolonged chase ensues. Johnny does leave behind something important: a live radio transmitter turned to the special channel Doc and his men use. “This guy is William Harper Littlejohn,” said the other. That apparently meant nothing to Kettler. “One of Doc Savage’s five righthand men,” announced the other. “Glory be! And I almost shot him! I’m pretty sure the “Glory be” is intended to mark the speaker as Irish, but I got distracted from that by wondering if Doc has five “righthand men,” who stands where. At any rate, Johnny is captured, and we leave him in dire peril, about to be frozen into the ice by the sadistic Kettler. “This is strange,” he said. His voice was a remarkable one — controlled, a voice that had undergone much training. Unusual as it was, the voice was hardly as remarkable as the man. Doc Savage was a giant. One did not realize that until comparison with ordinary objects, for his muscles were evenly developed; he did not have the knotted shoulders of a wrestler or the overdeveloped legs of a runner. Rather, his whole great frame was swathed in sinews that were remindful* of bundled wires. More striking was the bronze of his skin, a hue which might have come from many tropical suns, and the slightly darker bronze of his straight, tight-lying hair. His eyes were a little weird, being like pools of fine gold flakes being always stirred by tiny, invisible gales. I’m a little weirded out by the straight hair; it never occurred to me until now that Doc Savage could be read as mixed race, and this seems like Dent making sure we don’t. Huh. Doc summons another of his righthand men, Renny. Renny is described as a man with massive fists that he likes to use. Like all of Doc’s men, he is also a genius. We get to witness one of Doc’s trademark quirks here. Doc Savage was still in front of the radio. There now came into being a sound so soft and eerie that its presence was at first unnoticeable. It was a trilling, low, indescribably mellow, a sound so fantastic that it defied description. The fantastic note seemed to filter from everywhere; it was as if the very air were saturated with it. The trilling was the sound of Doc Savage, a small, unconscious thing which he did in moments of mental stress. He did not do it wilfully. He had made it always, since he could remember. And now he seemed to realize what he was doing, and the unearthly note died away. The phone rings; it’s another of Doc’s men, Monk, aka Lieutenant Colonel Andrew Blodgett Mayfair (“Only a few inches over five feet tall and yet over 260 pounds. His brutish exterior concealed the mind of a great scientist,” the frontispiece helpfully informs us) What’s new, pussycat, he asks Doc, only not in those words. An alarm clock just rang in my office and then there was a knife out of nowhere, Doc retorts. Of course the phone goes dead at this point. There had been a red light burning. That had gone out — very mysteriously. Something had fastened itself around Monk’s feet unexpectedly. In his excitement, he had tried to jump, howling at the same time, and had gone down. Absent-mindedly keeping a clutch on the telephone, he had torn it loose from its wires. He struck savagely with the telephone, hit nothing, and suddenly discovered the thing around his ankles was a cord. It was hard, stiff, slick. A thong of some kind of hide. An alarm clock sounds, and this time the weapon from nowhere is not a knife but an ancient Viking spear. When he manages to get the light back on, there is no one there. The secretary who came in was as near being the prettiest secretary as Monk had been able to achieve after interviewing some hundreds of applicants. She was excited, but that only made her prettier. Despite hiring practices that nowadays would seem less than efficient, the woman has “brains as well as beauty,” although the evidence of this is simply that she’s sure no one has come in from the outside. As one often does, Monk goes to fetch his pet to help with the investigation. Monk opened a mahogany door and entered a room which was undoubtedly the most expensive pigpen in the world. The floor was marble and covered with mats, and there was a trough of chromium, and various chromium self-feeders holding viands dear to the porker family. There was a stack of clean straw at one end. In the middle was a wallowing box perhaps ten feet square. The mud in the wallow was perfumed. The pig, Habeas Corpus, is a pawn in the ongoing feud between Monk and another of the men we haven’t met yet, Ham, who happens to be a lawyer. The devotion that both men devote to the feud is the sort of storyline that often leads to people falling into bed together. I will point out many, many examples of the interesting subtext created by this dynamic throughout these readings. Habeas turns to be of little use, but luckily Doc and Rennie enter to fill Monk in. They decide that someone’s trying to kill them all, and check in with the only other one of Doc’s men in town: Ham. Ham, it turns out, has disappeared from his swanky New York apartment, located in a building “so exclusive that a great many Park Avenue residents did not themselves know it existed.” There’s signs of a struggle, and none of his twenty-four sword canes are gone, a sure tell that he’s gone unwillingly. Investigation reveals blood under a window. Monk reacts strangely to the possible sign that something has befallen his longtime foe, at first so overcome he can’t speak. Out in the alley, they find a corpse, and then a cop, holding an exquisitely-cut jacket that they immediately recognize as Ham’s. All police in the city, it turns out, are under order to cooperate with Doc Savage. Asked where the coat came from, he replies that it “’Twas thrown out of a car.” Heading along the street, they find more of his garments. Retrieving them, they find Ham has left a message in one, written in the invisible chalk they all carry as part of their gear. The cryptic drawing mystifies Monk and Renny, but is easily deciphered by Doc and they head off to the location indicated, Diamond Point. Monk confesses he’s worried about Ham en route and praises his smartness in getting the message to them. “First time I heard you admit Ham had anything on the ball,” Renny boomed. “You’d be lost without him,” Renny said. At Diamond Point, they find the car. Gazing at the river, Doc abruptly strips down in a scene that if I wrote it would have a whoooooole lot more detail and goes in, turning out to be a remarkable swimmer. Underneath the water is the abducted yacht, now scuttled. More invisible chalk inside the abandoned car turns yields another clue decipherable only by Doc, pointing them to Carleth Air Lines, which belong to Thomas Carleth, a rich dilettante. Off to the Carleth flying field they go. The air field is apparently pretty different from our current day ones, and you get the impression each air line had their own. Its wharf holds a tender from the stolen yacht and the field itself backs onto a mansion that they surmise belongs to Thomas Carleth. It was a grotesque world through which they moved, this one lighted by the infra-red beam. It was as if they were part of a pale motion picture, a picture filmed through off focus lenses, or through a heavy cheesecloth, for the infra-red light did not by any means furnish an illumination that could compete with them. There were indentations in the ground in the ground, perhaps sixteen inches long, wider than a human foot at one end, and tapering. They were deepest at the wide end. The hair-raising part, though, was the gashes edging the marks. Gashes which might have been made by enormous, razor-sharp claws. Seriously, Dent never met an instance of passive voice that was not embraced by him. As Doc and the two right-hand men explore further, a smaller glowing creature appears, leading them to an ultramodern (by 1933 standards) plane. Renny captures the creature, which turns out to be Habeas, doused with the same liquid. A small, shrill whisper came from the captive’s lips. It was strange, that whisper. It might have been a man — or a woman. New chapter, and everyone reconvenes upstairs, where Doc says nothing of his epicene encounter. They look around so more, and Monk pulls Doc aside when he notices that the knife thrown earlier is the same one from Doc’s lab. Yep, Doc says, I threw it so I could distract everyone and go look around. Naturally, Monk asks what he found. Doc pretends not to hear. Doc can be a bit passive-aggressive at times, in my perception. Carleth proposes they check his planes, where they find one missing, along with charts leading to Greenland. Renny and Doc swiftly connect this with what they’d learned of the location of Johnny’s transmitter. Peabody suggests to his master that he propose joining forces with Doc and his men, and Carleth does so. Doc swipes left and says yeah, we, uh, need to go look for Ham, but I’ll call you. They head back to the car, and find the unconscious Ham beside it, wearing a gunnysack and snoring. Enraged, Monk is about to kick him in the ribs for sleeping on the job. My bad, Doc says, explaining he’s actually responsible. Doc demonstrated an ingenious mechanical device which had previously completely escaped discovery by Monk and Renny in their previous use of the car. “Don’t he look pretty in that oat sack?” Monk says in an observation that we may read as sarcastic or fond, depending on how much we want to subvert this text. Viva la homoerotism! I say, and plunge even deeper into the exploration. Ham said nothing more until he had full control of his faculties. Then he addressed Monk clearly and with a great deal of feeling. “You bug-faced ape,” he said. Monk glowered in a manner which was in marked contrast to his earlier expressions of concern over Ham’s welfare. Ham said, “I’ll poison you some day!” and went on with his story. Ham doesn’t really add much to what we know. They head back into the city to Doc’s airplane hangar, which turns out to be on fire when they get there, giving them little choice but to call Thorpe back. It had long been Ham’s ambition to acquire for himself a manservant who left nothing to be desired. In Peabody, Ham believed he saw the fulfillment of all his dreams. Earlier in the long flight from New York , Ham had spoken with Peabody and discovered the efficient Peabody knew his business. Peabody was the sort of a valet who would be horrified at wearing a black bow tie with full dress, the black bow being reserved for tux. Ham was half inclined to entice Peabody from his master by offering a larger salary. Reaching the site of Johnny’s signal, they find a wrecked plane, and the body of the man Johnny stopped for earlier. Carleth recognizes him and confirms with Peabody – he’s a mechanic that had worked for Carleth two years early. The plane, as it turns out, is Carleth’s missing one. They spot another body frozen into the ice, but while investigating, hear an approaching plane. Doc jumps into the plane they arrived in and takes off. The other plane’s shooting, so those on the ground hide in the snow. Doc’s doing well shooting at the other plane, when a stray bullet hits Monk’s chemical kits, releasing fumes into the cabin that threaten to overcome Doc. He smashes a window, bringing fresh air into the cabin and shoots at the other plane with special bullets which are charged with a chemical that turns its fuel inflammable. The other plane spirals downward but is lost in clouds; Doc finds no trace of its landing. Back at the camp, he’s told that it wasn’t Johnny’s body in the ice: just his parka. A new chapter starts with Johnny missing that parka: he’s trapped in an ice call, dressed in red flannel underwear and two flimsy blankets. Kettler, it turns out, was aboard the plane Doc rendered useless earlier; landing, they’d pulled white tarpaulins over it to render it invisible. It turns out they’ve kept Johnny for his knowledge of the ancient Viking language and they’re looking for some place called “Qui”. Someone is brought in for Johnny to act as translator for: the girl. Johnny looked at her, widened his eyes and made a silent whistle of amazed appreciation. This came, despite the fact that Johnny was about as impervious to feminine charms as they came. The exaggerated newspaper stories, growing out of the glimpse those on the yacht had had of her aboard the Viking dragon ship, did not even do her justice. She was not the tall, slim type. She was rather husky, in fact, but her curves were entirely pleasing to the eye, and she had features that were a pleasant relief from the doll-faced types popular in the motion pictures at the moment. Well, props to Dent for a husky heroine and going against the time’s beauty norms. Maybe. Johnny speaks to her in the language identified variously as ancient Viking, old Norse, and “the Viking tongue.” He manages to create a diversion; he and the girl, whose name is Ingra, flee. They split up and we find out that it’s a good thing the pursuers have chosen to follow Johnny. In a way that will become familiar over the course of these books, he’s perfectly suited to the situation, having been a long distance runner in college. Unlike most college athletes, Johnny was now in better condition than during his scholastic days; some freak in his make-up — Doc Savage had diagnosed it as an unusual glandular condition — had endowed him with muscles that were more like violin strings than those of an ordinary man. The bony archaeologist’s endurance was fabulous. There’s some ambiguity there as to whether his muscles resemble a violin string’s more than they do an ordinary man’s muscles or whether they resemble a violin string much more than an ordinary man’s muscles resemble a violin string. Sometimes looking at Dent’s sentences too closely can cost you sanity points. Johnny’s race is cut short, however, when he falls into a crevasse. His pursuers arrive and can only see his parka to indicate where his form has fallen. They empty their clips into it and presume him dead. One piece of equipment which another would certainly not have neglected, Doc Savage did not carry. He took no gun. This was in keeping with a policy which he had long ago formulated, that of having nothing to do with firearms. For this he had a reason: the thorough conviction that one who comes to depend on a gun is the more helpless than without the weapon. Doc laughed. He released her. The laugh was not because there was anything funny. It was to reassure the young woman. Maybe I’ve just been watching too many episodes of Criminal Minds, but this does not actually seem like a reassuring act. Nonetheless, it does the trick, particularly when Doc Savage reveals he speaks the Viking tongue better than Johnny. Questioned, Ingra declares, “I am one of the slaves of the Qui.” She’s been kidnapped from Qui by men who thought she’d be able to lead them back there since she knows enough astronomical navigation to do so. The conversation’s notable because there’s not a hint of flirtatiousness about it. I remember Doc having to fight women off (there will be so much more on Doc as ace character over the course of these posts). The plane shows up; Ingra is recaptured while Doc eludes pursuit by hiding in a snowdrift. “Gonna give me a job as your valet, huh?” he snarled, and slapped Ham as hard as he could. Then he went and sat back down. Monk squinted and saw Ham had not been knocked entirely senseless by the blow, but only dizzy, after which Monk rolled his small eyes and added insult to injury. “I wish you did have a valet with manners like that,” he said. Why manners is stressed is anybody’s guess. Peabody and Kettler are reunited, along with their captives. Ingra is in the mix, and being tormented to lead everyone to Qui, which she refuses to do. Kettler decides to kill Ham to show her they mean business, but she agrees before he can carry out the threat. They head off to Qui. They think they spot Doc along the route, but can’t find him. Doc, who has resorted to the by now familiar strategy of hiding in a snowdrift, emerges after they have moved on and starts after them on foot, accompanied by Habeas. He picks up Johnny’s trail and finds himself in a hidden area with cultivated trees and fields. Exploring further, he is captured by the denizens of Qui: men the size of small boys. They were amazing little fellows, possibly not as small as it had seemed at first. Doc had once visited pigmies in Africa. These fellows were about the same size, although a bit broader and with round, butterball faces — the young ones. The old ones were walking masses of wrinkles. Doc decided they were ordinary North American aboriginal stock, who had been stunted by some freak of heredity or environment. I can’t even begin to untangle some of that, so I’m going to silently point and then move on. There turn out to be a number of slaves of Qui, all various wayfarers who have stumbled on Qui over the centuries, including more than one dragonboat’s worth of Vikings. Doc is reunited with Johnny, who turns out to be one of them. Doc fills Johnny in on events so far, and reveals that he’s aware that Peabody and Carleth are not on the up and up. This is because of the long ago basement encounter, which Doc starts to describe in detail. Unfortunately, he’s interrupted halfway through by the sound of approaching airplane engines. The planes contain Kettler, the villainous Peabody, their gang, and their captives. There’s a fight, and Doc and his folks manage to free the other righthand men. The maddened Qui destroy the planes. Doc gets Ingra to negotiate a truce between his party and the Qui. She’s impressed when he manages to do so and informs him, “Your tongue is the mightiest of your weapons.” Here I silently wiggle my eyebrows in a salacious manner and toast to unintentional double entendres. Ham and Monk vie for the attention of Ingra as a prolonged siege ensues. Pressed to the brink, the Qui folks agree to give Kettler and his men the treasure of Qui and also the privilege of killing Doc and his men. Kettler’s crowd was not satisfied with all they brought up. There was, for instance, much copper, which of course was hardly worth packing back to civilization, and which was the more aggravating because Kettler’s men had difficulty telling it from the gold in some cases. There were old ship’s kettles, binnacles, railings, mostly of copper, bus some of brass. It was obvious that the small men of Qui, having learned yellow metal was prized by men of the outer world, had failed to distinguish between gold and brass and copper. Also between silver and lead, it developed, for they found a number of tons of ballast lead taken from some ship. I did look back in the text at this point to see if I could find any tiny women of Qui, but they seem to be lacking. I like to think they rebelled a few weeks ago and struck off on their own, and that why the men seem particularly directionless at time. This addition to the text has absolutely nothing to support it. Kettler is about to shoot Doc and his men, when Carleth betrays him and shows up with a machine gun. Various alarums and excursions occur, particularly after Carleth’s eyeglasses fall off. Doc and his men escape, along with Carleth, heading through an ice cave towards the coast. It’s revealed that Carleth was the man in the basement from much earlier. Kettler pursues with his men; the entire group is drowned while trying to cross a stretch of water as Doc and his men watch. There was no beach now. Waves were piling in. Offshore, there was a tide rip, and this tossed up waves that came lunging in furiously. The man who had shrieked was in the water, being lifted, battered against the stone, carried back, flung agains the cliff again. A moment later, another man was off his feet. Then Peabody and Kettler went almost together, as they turned and tried to fight their way back. The water was cold enough to chill the strongest swimmer into a near paralysis, and even had any of them been able to keep afloat, the waves would have driven them agains the rocks. It became certain that they were to drown, to the last man. The money from the antiques, Doc Savage employed to purchase a shipload of commoner conveniences of civilization, and this was delivered to Qui by men who knew how to keep their mouths shut. The first shipped did not take all of the money; there was more for the years following. I do wonder what the Qui will sell once they’re out of antiquities yet still hooked on the “commoner conveniences of civilization.” Perhaps they’ll open up to tourism at that point. Some takeaways. The scene break stuff actually was useful. It reminded me of Don Maass’ writing advice to have something kicky every page or so, and showed a number of possible strategies for doing so, some of which I was fonder of than others, but certainly gives hints for writing serial fiction. Along the same lines, some of the holes and gaps never get filled in, yet that serial nature may help keep the reader from noticing in a serial. For instance, remember the glowing liquid and giant claw marks from earlier? Never explained. *This is an actual word, not a mistake. I checked. **If Carleth’s name were Sherman, this would be delightful. This entry was posted in you should read this and tagged doc savage, quest of qui, william harper littlejohn, you should read this. Bookmark the permalink. I’m pretty sure that under that arctic coat, Doc’s shirt is magnificently torn. I don’t know why his amazing vest doesn’t show in any of the cover pictures, come to think of it. As to that trilling sound, it doesn’t come from his mouth. Everybody does their best to pretend they don’t notice. The idea that it only happens in times of “mental stress” makes that image even better. Actually, they were published as complete novels, once a month, not serialized like Dickens. 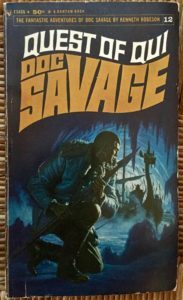 Don’t get me wrong, I’m a HUGE Doc Savage fan, ran through these as much as I could in the 6th and 7th grade and beyond. Your review is spot-on, and priceless. Look forward to more. Really? I’m just mystified by those scene breaks, then. They are very consistent in length. I’m glad you enjoyed it. I do love Doc and the second one I’m working on is proving just as much fun. The Spook Legion is great. At least the way I remember it, and I read it as an adult. Rather than engage in any close reading of the text, I prefer to think of Ham and Monk as Laurel and Hardy and leave it at that. I prefer to think of Ham and Monk as Laurel and Hardy and leave it at that. Richard Sale co-wrote one with Dent. Talk about your high-powered collaborations! Now I want to read that one again and see if I can tell. Yeah, the young teen years is about the perfect time for discovering Doc and his crew. The big disadvantage to the Bantam reprints was that they were printed out of original publication order. So, the first three books (“Man of Bronze” “The Land of Terror” and “Quest of the Spider”) are spread out through the second printing run. All three reflect that Dent hadn’t quite figured out the template for the series, so there’s a bit of bloody violence you don’t see later on. Of course, in “The Land of Terror” you also get dinosaurs, so there’s that. Conde Nast bought Street & Smith – the Doc Savage publisher – in 1959. Bantam obtained the reprint rights so the two of them split the proceeds. I suspect Dent’s work was “work for hire” so his estate is probably out of the financial loop since he died in 1959. Imagine writing all of those novel every month … and probably on a manual typewriter. Think of the carbons! Conde Nast and Bantam did pretty well, then, I think. I have no clue how lucrative or not the Doc Savage Magazine was, but they wouldn’t have kept publishing if it wasn’t making -some- money. Oh god, carbons. That’s how I had to do my master’s thesis.